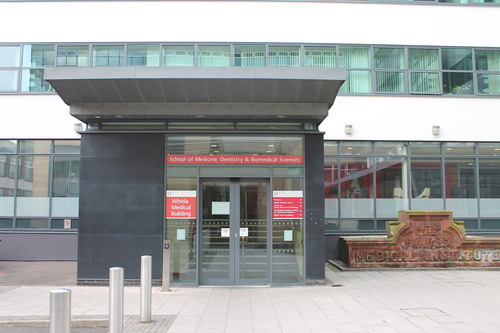 The Medical Institute dedicated to Sir William Whitla was moved to Queen's University of Ireland, in Belfast: there is a marked difference between the old Whitla Medical Institute in College Square North and the new Whitla Medical Building. The former was a stone building, the latter a modern steel-framed building with concrete cladding. 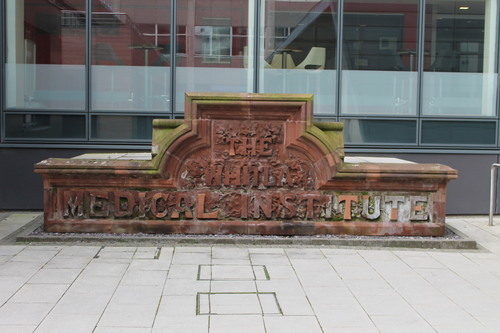 The stonework containing the title "Whitla Medical Institute" was removed and stored and has now been installed in the ground floor of the Whitla Medical Building. The stained-glass windows all found a home in the new building which also houses the bust of Whitla and the posthumous portrait by Frank McKelvey of Sir William Whitla.